Annette von Droste-Hülshoff was born at Schloss Hülshoff near Münster, the daughter of an aristocratic Catholic family. She had two suitors at age 21, but never married. 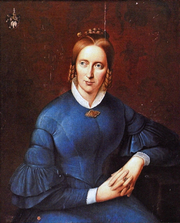 Annette is often called Germany's greatest 19th-century female poet. She was said to have a powerful mind in a delicate, sickly frame. Her maternal uncles August and Werner von Haxthausen brought her into contact with the Romantic movement via their intellectual circle, which included Wilhelm and Jacob Grimm. She was also a close friend of Adele Schopenhauer and through her met her network of friends in Weimar. Annette and her sister Jenny contributed Westphalian folk tales to the Grimms' famous collection of fairy stories. However she's best remembered for her lyric poems, pastorales, ballads, and the novella "The Jew's Beech" (1842), a crime thriller in Gothic fiction style. Colllected editions of her works have been published for many years. Annette von Droste-Hülshoff is currently considered a "single author." If one or more works are by a distinct, homonymous authors, go ahead and split the author. Annette von Droste-Hülshoff is composed of 18 names. You can examine and separate out names.